Jose Rizal is a phenomenon. An ophthalmologist by profession, our country’s national hero is also a writer and all sorts of an artist. Consequently, he has a number of oeuvres—most of them are already at the National Art Gallery and most probably in some private residences. Recently, the heirs of Narcisa, sister of Jose, conferred with Leon Gallery. They want the hero’s large wooden sculpture to be put on the block for auction. 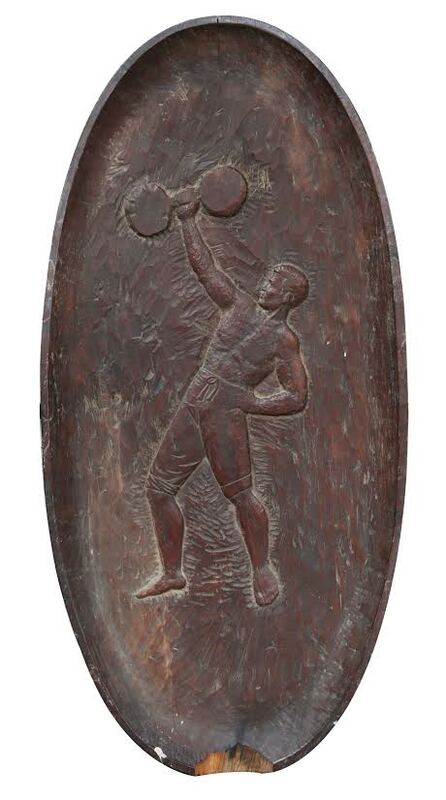 It’s an oval bas-relief wood sculpture (39 inches long, 18.5 inches wide, 2.5 inches high) carved from a heavy wood, possibly narra, made by Rizal during his exile in Dapitan (1892-1896). It’s set to be auctioned on June 9. The carving is said to be the “unique and first prototype of the Filipino: virile, muscular, and engaged in a highly civilized European display of strength.” It portrays a half-dressed young man in knee-length pantaloons, holding a barbell, showing off defined arms, tight abdomen, and a solid chest. “In fact, a case may be made that this could be a self-portrait of the hero himself, as truly, the ‘First Filipino,’ not only gifted and mentally acute but also an outstanding physical specimen. Jose Rizal in profile, bears a striking resemblance to the athlete in the sculpture,” writes Leon Gallery in a statement. Also according to the auction house, the piece’s provenance stems from the family of Narcisa as she and her daughter Angelica used to be frequent visitors to Dapitan. They also escorted Rizal when he came back to Manila at the end of his exile. This is just one of the historically important lots at Leon Gallery’s Mid-Year Auction. Read here for more.